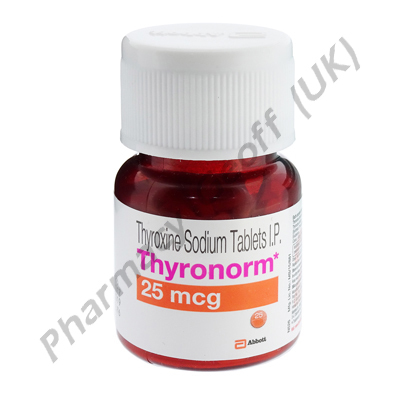 Thyronorm (also known as Thyroxine Sodium or Levothyroxine) is often prescribed for patients that have a thyroid that is under active. This medication allows more of the thyroid hormone to be released into the body. It compensates for what the thyroid gland isn’t able to produce on its own. Regulation of the thyroid hormone is very important as it can affect energy levels as well as mental well being. This medicine should be used daily for the best results. If doses are skipped then the hormones will be harder to regulate. The amount of this medicine a patient needs depends on their test results. It is very important to work closely with the doctor to determine how much to take. Never change your dosing on your own as that can be dangerous to your overall health. Taking Thyroxine Sodium 1 hour before you eat anything in the morning is the best way to benefit from it. Consuming a full glass of water with the medication is recommended. For adults, this medicine is offered in a capsule form. For young children, it can be offered in a chewable pill or a liquid form. Most individuals that benefit from this medicine will need to take it for life. It is important to know that many prescription medications and over the counter products don’t interact well with Thyroxine Sodium. Always consult with your doctor before you take any other medications when you are using this particular one. Some patients start to notice hair loss during the first couple of months that they take Thyroxine Sodium. It should subside after that period of time and the hair loss won’t be permanent. There are some individuals that experience sweating more than usual, sensitivity to sunlight, headaches, and fatigue with the use of this medication. As the body gets used to it and the dose is regulated though those side effects should subside. Let your doctor know right way if you experience problems with your breathing, your vision changes, or your heart is beating faster than normal.